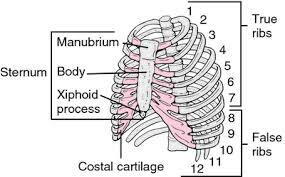 The xiphoid process is the smallest of the three sections of the sternum or breastbone. It is a thin and elongated, cartilaginous in structure in youth, but becomes ossified at its upper part in the adult. The xiphoid may be broad and thin, pointed, bifid, perforated, curved, and may deviate laterally. Xiphodynia is pain originating from the xiphoid process. Xiphodynia usually originates from trauma, such as a motor vehicle accident, to the area but may also result from heavy lifting or exertion. The xiphosternal junction is also prone to osteoarthritis, rheumatoid arthritis, and other auto-immune diseases. The pain may be located in the chest area and radiate into the back or abdomen. It may be associated with nausea, vomiting and diarrhea. Bending over may worsen the pain as will coughing. X-rays and MRI scans may be useful to look for fractures or abnormalities of the area as well to exclude other causes of pain such as tumors. The pain of xiphodynia may mimic the pain of cardiac origin and this must be excluded before proceeding with treatment. Treatment begins with conservative modalities such as rest, alteration in activity level, non-steroidal anti-inflammatories and physical therapy. Injection of the xiphosternal junction with a local anesthetic and a steroid may cure the problem. However, this injection is not without risk, such as puncture of the lung and should only be done by a trained physician. What kind of Dr should one go to when someone with marfan’s syndrome, a prime candidate for slipped rib syndrome, to begin testing and eventually receive a nerve block?